It was nice to take a break from the good ole' master closet makeover and do something more crafty. I am loving my new Valentine's decor! So pop on over and check out how I made it, and hopefully get inspired to make your own! That is very cute! I like projects made of several different materials. This is so cute! 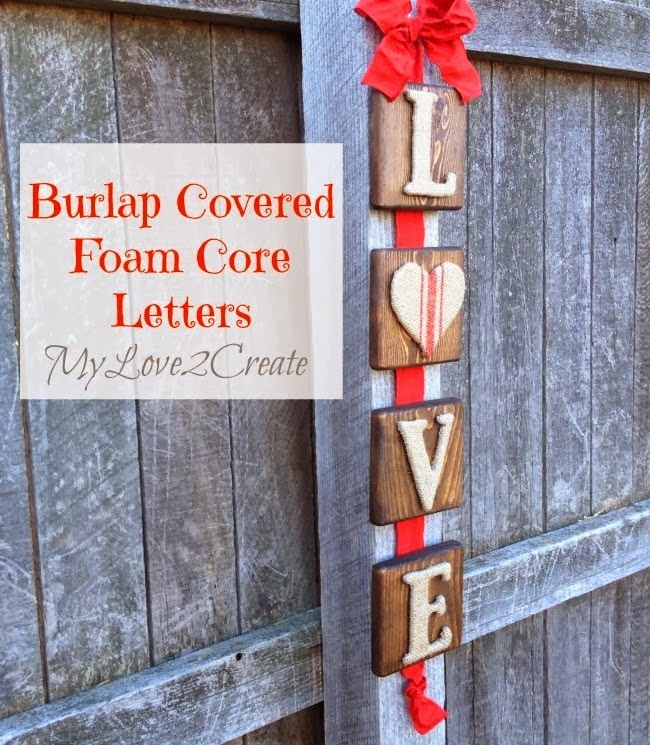 I love the burlap and wood with the pop of red! Thanks for sharing at the Creativity Unleashed party this week - you've been pinned!! Super pretty. Its amazing how burlap can look great when used right! Gorgeous! I love that it's not super pink or overtly red. The rustic burlap and wood backing are perfect. I'm featuring you tomorrow on Gingerly Made! Thanks for linking up. What a great idea and I love the wood blocks! Stopping by from Do Tell Tuesday. Cute! I like that the "o" is a heart. I love it! Thanks for sharing at the party Mindi! Theresa @DearCreatives Have a great rest of your week!! This is really pretty, I love the rustic look of it. Thank you so much for linking this up at the Shine a Spotlight Saturday Link Party on Angels Homestead this week! So original and cute Mindi! Love the heart covered with a grainsack stripe. Thank you for sharing it at What We Accomplished Wednesdays. Have a great weekend!